Figurine of woman from Thermi on Lesbos The outstanding position of woman on the Greek island Lesbos in ancient times already becomes evident by the fact that the most famous poetess of antiquity - Sappho - comes from there. and as around an altar, stood the women. In her poem the self-confident and independent position of woman on Lesbos becomes manifest. The poet Alcaeus - also coming from Lesbos and a contemporary of Sappho - describes the women from Lesbos in a similar way in this poem. Lesbos is the third largest island of Greece and lies in the Aegean Sea. It much differs from its neighboring islands because of its rich vegetation. Even in midsummer a green countryside is predominant. Arrowhead from Thermi on Lesbos From the ancient historians we have got clues towards the special position of women on Lesbos by connecting the history of the island with the Amazons. She (the Amazon queen Myrina) seized also some of the islands, and Lesbos in particular, on which she founded the city of Mitylene, which was named after her sister who took part in the campaign. There are a lot of prehistoric finds from the Early Bronze Age (third millennium BC) which indicate that there existed a culture with matriarchal orientation. Moreover, there are cross connections with the Amazon cultures at the river Thermodon and on the island Lemnos (Limnos). In Thermi, some kilometers north of the island capital Mytilene, there was unearthed an important prehistoric settlement dating from the Early Bronze Age. The architecture of this prehistoric city is very similar to the contemporary cities Poliochni and Myrina on Lemnos: There is an urban settlement enclosed by a mighty city wall, houses in the so-called Megaron style which directly adjoin, roads with public places and wells. The buildings altogether are very uniform which give evidence for an egalitarian society - a society with no or at least very little social differences. This social form is characteristic for matriarchal societies. The community was not controlled and regulated by law and order but by the natural authority of the »wise women«. The prehistoric settlement Thermi is presumably identical with Mytilene, which according to the ancient tradition was founded by the Amazons. 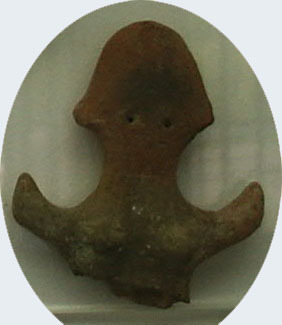 Arrowheads: The prehistoric arrowheads from Lesbos can be connected with the ancient tradition that the Amazons have been excellent archers. Figurines of woman and female idols. There have been found numerous figurines of woman. Actually, there are two types - the young, martial woman in the tradition of the Greek goddesses Athena and Artemis, respectively like the Amazons. Secondly, there is the type of a seated matron representing the almighty mother goddess, the prehistoric »Great Mother«. This type can be equated with Cybele or the Greek Goddess Hera. Crescent-shaped pendants: The characteristic shield of the Amazons (so-called Pelta) was crescent-shaped. In general, the moon was of special significance for cultures with matriarchal orientation. Pottery: The is a striking similarity of the prehistoric pottery from Lesbos to pieces found in the Dündartepe (Thermodon) culture. In particular, there is a very similar ornamentation (linear incisions and grooves). Significant worship of the goddess Cybele. On Lesbos there have been found numerous statues and reliefs which represent the goddess Cybele or are dedicated to her. In the most ancient part of Mytilene there has been unearthed a sanctuary of Cybele. She was the Asia Minor version of the almighty prehistoric mother goddess - the »Great Mother«. In Agiassos on Lesbos there is a very famous church dedicated to the Lady (Panagia) - it is an eminent religious center, pilgrims from near and far come to this place. By worshipping the Lady there presumably survives the ancient worship of the prehistoric »Great Mother« - the almighty matriarchal goddess - until the present. Megalithic buildings and Pelasgian walls. Remains of prehistoric buildings made of big boulders without using mortar (the so-called Megalithic building style) and walls in the same style (the so-called Pelasgian walls) have been discovered in various parts of Lesbos. The same building style we could trace as well in Lemnos as in the Thermodon region (Dündartepe culture). The sacred rock of Petra. In the north of Lesbos near the city Methymna (Molivos) there is a famous place named Petra. In its name itself - Petra is the Greek name for rock - the significance of this place becomes clear. It is a huge rock with a church on top. It can be assumed that already in prehistoric times this place was an important place of worship. Similarly, there is a sacred rock on the island of the Amazons in the Black Sea (called Aretias - today: Giresun Adasi) which even today is of religious significance. Also on Lemnos there is a sacred rock - Riha Nera at Myrina. In Skala Sikaminea in the northeast of the island there is a small chapel which is dedicated to Panagia Gorgona (Panagia = Mother of God). In the ancient tradition Gorgons were Amazons. Accordingly, this chapel has got an Amazon name as epithet for the Mother of God. Also the capital of Lesbos Mytilene (Mitilini) has an Amazon name - a surprising coincidence!